Marc Lalande, chairman of the Department of Genetics and Developmental Biology and director of UConn's Stem Cell Institute. The UConn Health Center’s Cell and Genome Sciences building, which opened last summer, houses about 100 scientists and 25 labs, as well as some of UConn’s major research programs. including the UConn Stem Cell Institute and the Department of Genetics and Developmental Biology. Especially designed to promote interdisciplinary research among the academic and industry scientists housed there, the building has become a vibrant center of collaborative expertise that seeks to revolutionize the practice of medicine. The recent legislative passage of Gov. Dannel P. Malloy’s $864 million Bioscience Connecticut initiative, aimed at making Connecticut a leader in the health and bioscience industries, is stoking optimism among the stem cell and genetic scientists in the new facility over future possibilities for UConn to distinguish itself in research. 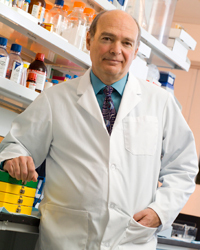 Marc Lalande is professor and chairman of the Department of Genetics and Developmental Biology and head of the Stem Cell Institute. He is also senior associate dean for research planning and coordination at the UConn School of Medicine. The Lalande laboratory in the Cell and Genome Science building is focused on the role of epigenetics in disease and development—epigenetics is the study of heritable changes in gene function. Lalande’s research team has spent years studying Angelman and Prader-Willi syndromes, two relatively rare genetic disorders. He says their goal is to broaden that research base to more common disorders such as ADHD, autism, and schizophrenia. Lalande spoke recently with UConn Today about the new Bioscience Connecticut initiative and its implications for stem cell and genetic research at UConn and its Health Center. What does Gov. Malloy’s Bioscience proposal mean for the UConn Health Center’s research enterprise? It will allow us to complete renovations of the hospital’s largest research building constructed in 1972 and now very much in need of an overhaul. With modern, state-of-the-art labs for immunology, vascular biology, neuroscience, cellular and molecular biology, it will allow us to recruit the best research talent in these areas. It will also create an environment for innovation, discovery, and the potential commercialization of new research ideas. Does the Bioscience initiative have the potential to make Connecticut a leader in a bioscience economy? Can you tell us more about what kinds of research projects will take place? Our goal is to have basic research scientists and clinical investigators applying a broad range of innovative approaches in areas where we are already strong, such as neuroscience, immunology and microbiology, vascular biology, regenerative medicine and skeletal development, and structural biology. The Health Center has a strategic research plan that highlights cross-disciplinary and translational areas, such as in our Center on Aging. We will recruit a cadre of researchers conducting studies in fields such as health outcomes and population biology working next to basic scientists, with the goal of increasing our knowledge and understanding of the aging process. We also want to move stem cell research from the lab to the patient. Basically the more active and the larger the research program, the bigger the chance that we will have discoveries that have commercial possibilities. How important is the Bioscience initiative to helping jump-start industry-university partnerships based on the bioscience research taking place at the Health Center? The recruitment of outstanding faculty members with new and complementary areas of research expertise will play a key role in helping bring entrepreneurial start-up companies to Connecticut. Basic research and lab discoveries are what drive commercial possibilities, so to have the highest chance for lab discoveries we have to increase our teams of top researchers. That’s the No. 1 goal. Recruiting world-class scientists will also make us more competitive for federal grants, which is also a huge economic stimulus for the state. Venture funding typically follows after federal funding. So cutting-edge lab space allows us to recruit scientists who will increase the chance for us to make discoveries and turn research into businesses or products that will boost economic development.